Weighing in at 1,630kg with a rake-adjustable wing and embiggened-gapping grille sucking in precious oxygen from its surroundings is the Mercedes-AMG GT R. If you thought the regular AMG GT was the current enfant terrible of the automotive world and was the quintessential Teutonic muscle car and purveyor of bad attitude, then think again. This is its badass brother that (allegedly) abuses steroids and (rumour has it) has probably served some hard prison time that you don’t want to ask too many questions about. America may have invented the muscle car, but it is AMG – the high-performance division of Mercedes-Benz – that has perfected harnessing bad attitude and brutality into mechanical aggression. The name might suggest that it is a grand tourer; however, even the standard car is a little bit too angry for that description to sit comfortably. 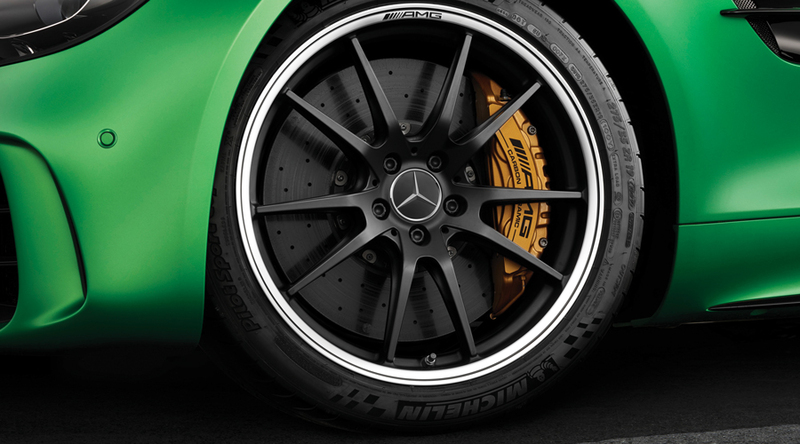 With the AMG GT R, a much more purposeful and track focused weapon, the attitude has been dialled up to 11. The front-mounted 4.0-liter turbo V8 now produces 577bhp and 700Nm torque thanks to revised hot-v-mounted turbocharges and a rise in boost pressure from 1.2 to 1.35 bar. To manage all that power and torque through the rear wheels, AMG has installed its nine-stage traction control system, which is ‘borrowed’ directly from the GT3 racecar. 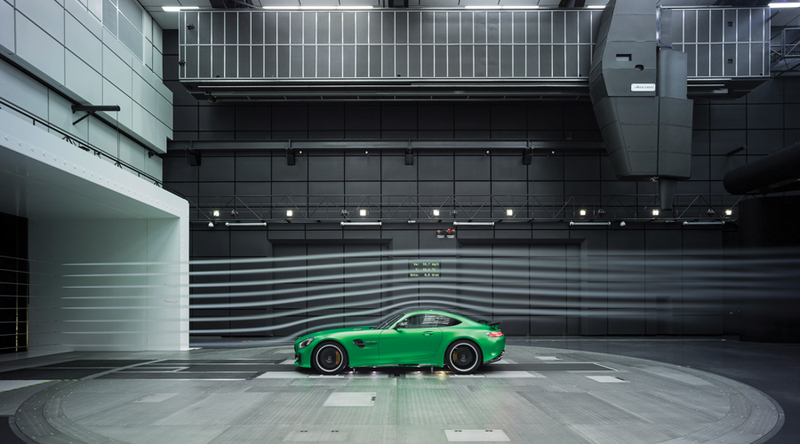 It also has a wider track, new suspension settings and active rear steering which, combined with the optional carbon ceramic brakes, leave no doubt that the AMG GT R is unapologetically focused in its aggression. That bad attitude that AMG imbues its vehicles with is surprisingly contagious. 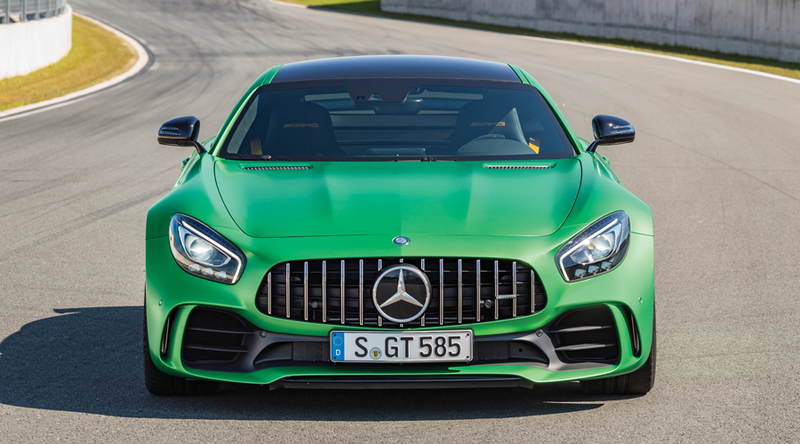 Once sat behind the wheel of the AMG GT R don’t be surprised if you suddenly start taking great delight in waking up the neighbours, scaring small children and channelling your inner hooligan. Oh, and speeding tickets. Be prepared for speeding tickets. Lots of them. 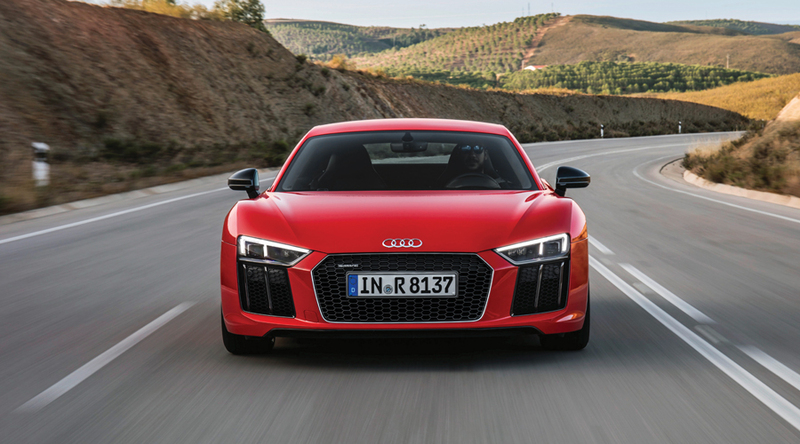 Tony Stark drives an Audi R8, and if it’s good enough for Iron Man, it is certainly an option for Emirates Man. With its refined looks and 5.2-litre naturally aspirated V10 placed right behind your ears, Audi’s flagship model has justifiably earned its reputation as the thinking man’s supercar. The typical Audi virtues of fantastic build quality, comfort, safety and refinement are all present and correct here. As is its modern, sharp architectural design and beautiful interior cabin space constructed from high-quality and tactile materials. But in the R8 V10 Plus it’s all about that engine, which, quite literally, takes centre stage mounted in the traditional supercar mid-engined layout. 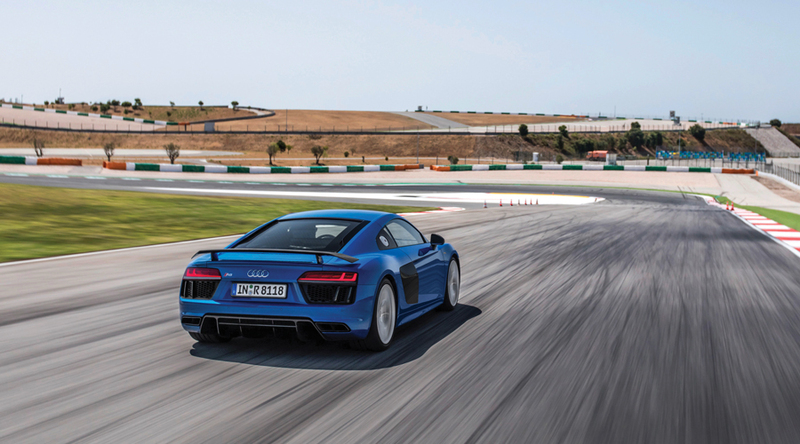 With 602bhp and 560Nm of torque, the R8 V10 Plus hits 100kph in 3.2 seconds and goes on to 330kph. That’s genuine supercar performance accompanied by a suitably exotic and unmistakeable V10 soundtrack playing right out to its 8,500rpm crescendo. Any doubters of the R8’s legitimate supercar credentials can be reminded that this same Audi-developed V10 engine and chassis – albeit dressed in different clothing – is what propels and underpins the Lamborghini Huracán. Although Lamborghini will charge you a premium for the pleasure. 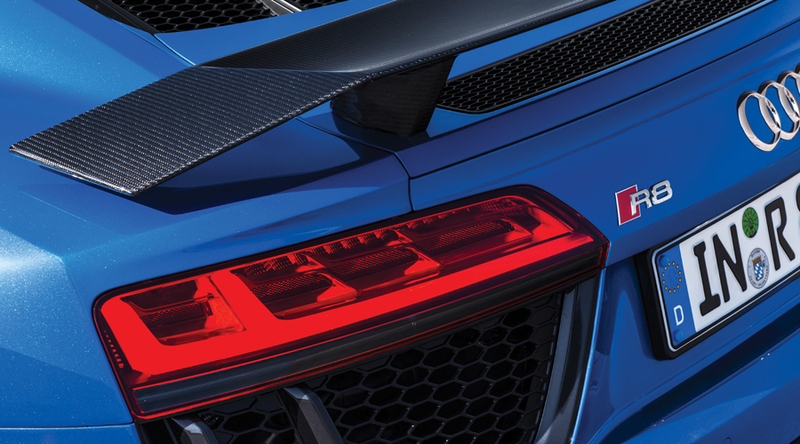 It is really the usability of the R8 V10 Plus that sets it apart from any direct competitors. All that power is delivered via a seven-speed S-tronic dual clutch auto transmission to a confidence inspiring quattro all-wheel drive system. It’s a perfectly poised, balanced and forgiving masterpiece, which has had all the know-how of Vorsprung durch Technik generously sprinkled directly into its deoxyribonucleic acid. Few cars offer such exhilarating performance on the racetrack combined with refined comfort and usability on the road. Lexus, however, has come of age. Toyota president Akio Toyoda has gone on record stating that “the long-term success of the Lexus brand requires going beyond smooth, quiet and comfortable A-to-B transportation” and that the word “boring” will never coexist in a sentence with “Lexus”. If the new Lexus LC 500 is anything to go by, we think Toyoda-san may be on the right path. Visually, the LC 500 remains remarkably true to the original LF-LC concept. 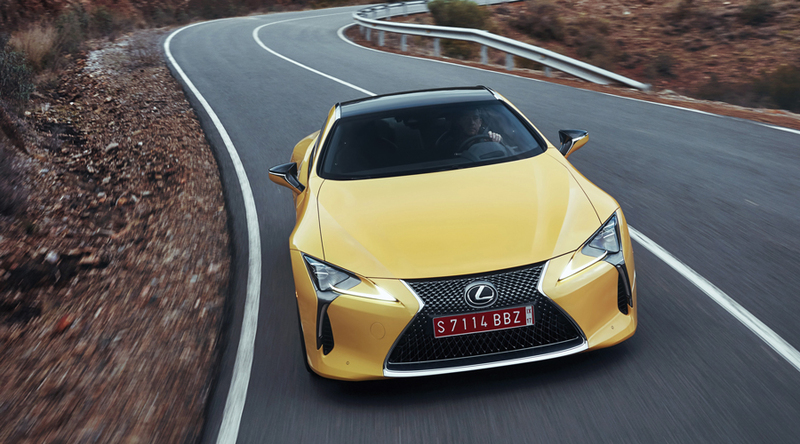 The giant meshed bowtie Lexus grille, floating rear pillars and chrome blades framing the roof are all still present and combine with the sharply angled sheet metal and three-LED headlights hinting at refined aggression and a serious performance car. According to chief engineer Koji Sato, it is also the most torsionally rigid Lexus ever with its unibody being constructed from a mix of aluminium, steel and carbon-reinforced plastic. 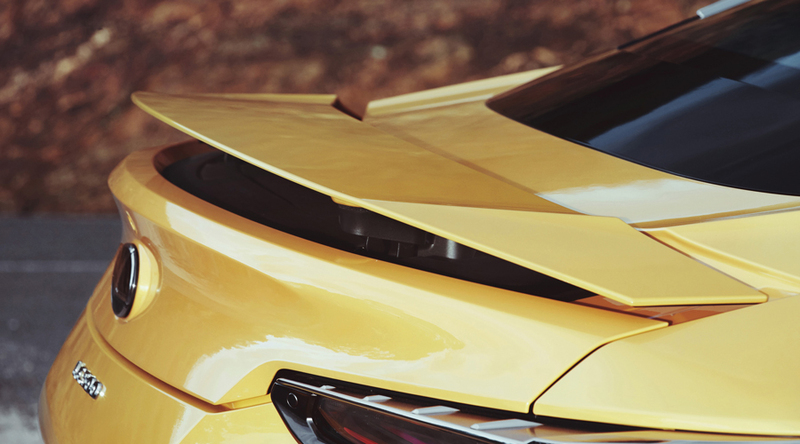 Due for release later this year, the LC 500 features a naturally aspirated 5.0-litre V8 with most of its mass behind the front axle for better weight distribution. Power output is quoted at 471bhp at 7,100rpm, which is transmitted to the rear wheels via a Direct Shift 10-speed automatic transmission, an industry first for a luxury vehicle. 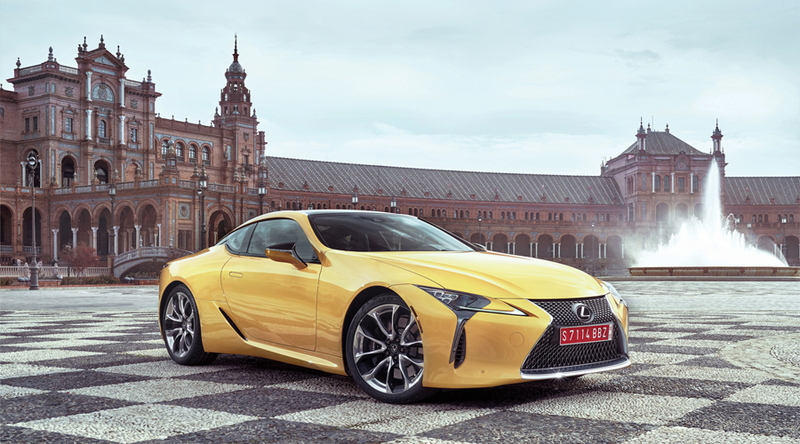 However, this being Lexus, a hybrid version will also be offered – the LC 500h – that combines a 3.5-litre V6 and electric motor.